For the tenth year in a row, I am publishing an account of my top 10 best and worst sports moments of the past year. Scroll through the blog archives if you want to see the previous editions. Keep in mind that these are given from a purely subjective viewpoint. When I say “best/worst moments” I’m not talking about great or horrible sporting events. I’m talking about moments that affected me the most positively or negatively. Overall, this was a good year in sports for me featuring several monumental moments that outweigh the disappointments. Without further ado, here are my best and worst sports moments for the year 2018. 1. Top Life Goal Accomplished: UMBC pulls off first 16 over 1 Upset in NCAA Tournament History (March 16, 2018)– Now, I can die in peace! Ever since, I became a sports fan in late 1991 (I was six years old at the time) I have been obsessed with the quest for the holy grail of all upsets. In over the thousands of years of recorded sports history, we had seen about everything, except this: a 16 seed beating a 1 seed in the men’s NCAA basketball tournament. UMBC finally accomplished this feat this past March in shocking fashion by not only beating the # 1 overall seed (Virginia) but by beating them by 20 points. The fact that it happened in my home state, which enabled me to pay tribute to the Retrievers by attending their second round game, made it even sweeter. There are embarrassing videos my wife captured of me jumping in the backyard fish pond and then screaming and crying as the game went final. This wasn’t just my top sports moment of 2018. It was a top five sports moment in my lifetime. 2. Loyola Chicago and Sister Jean make stunning Final Four Run (March 24, 2018)– Most years this would be the # 1 overall moment but because of the forementioned 16 over 1 upset it wasn’t even the best moment of the 2018 March Madness. Nevertheless, this was beyond huge! Not only was Loyola-Chicago a mid-major 11 seed making the Final Four, which has only happened three times in this history of the tournament, but it was the first automatic qualifying 11 seed to make it there, meaning it was the first time that a team who would not have received an at-large bid played in a Final Four. The fact that the Ramblers accomplished this feat while also possessing one of the best sentimental storylines in the history of sports, Sister Jean, made this moment truly incredible. The quote I will most remember from this year in sports came in Loyola’s pregame press conference at the Final Four in San Antonio. Sister Jean came on stage to answer questions and a reporter asked her where this final four run ranked amongst her amazing ninety-eight years of life accomplishments. She responded by saying “this is the most fun I’ve had in my life.” Pretty powerful words from a nun reflecting on her life’s work. 3. 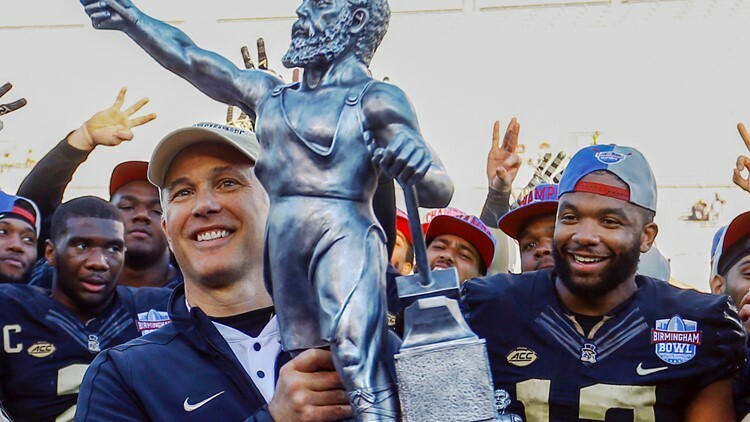 Wake Forest beats Memphis in Birmingham Bowl thriller (December 22, 2018)- This might be a bit of the recency effect in action, but my # 3 moment is going to be a game from just three days ago. This was by far the most thrilling game I attended in any sport in 2018, as my Demon Deacons won a game that had two lead changes in the final two minutes and featured a narrowly missed last second field goal that would have sent the game into overtime. This moment is boosted by the fact that I was able to sneak onto the field after the game for my first field/court storming in several years, and the first-ever in a bowl game. Some people say that these mid to low tier bowl games are just glorified exhibition games that don’t really matter, and I couldn’t disagree more. These games are mini-championship games that allow teams having good seasons to end their year as champions. Is there really any difference in celebrating a SEC Championship, a national championship, or a Birmingham Bowl championship? In all three situations, the mechanics are the same. A team storms the field, drenches their coach in gatorade, holds up a championship trophy during a postgame ceremony, wears championship hats (see picture below), and typically makes a championship ring to commemorate their accomplishments. Don’t get me wrong, I think the bowls themselves are inadequate ways to decide national champions. An eight or sixteen team playoff is the only way to declare a legitimate national champion in FBS college football, but bowls are championships in their own right and should be treated as such. 4. 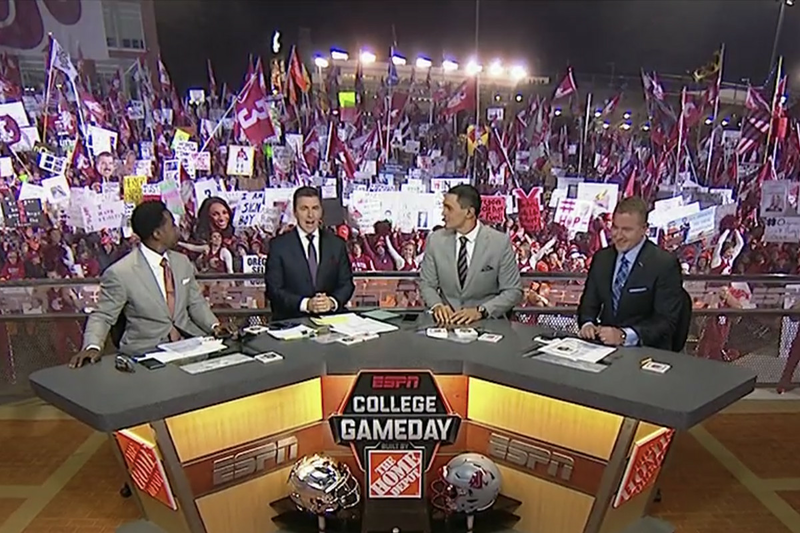 Washington State wins College Gameday game while Purdue simultaneously upsets Ohio State for Tyler Trent (October 20, 2018)– Some college football Saturdays rip my soul out, while others lift me to the highest of highs. week 8 this year was definitely the latter as two great college football results coincided to great one incredible moment. Washington State has been my favorite Pac-12 team ever since they hired Mike Leach (my all-time favorite coach in any sport), and after over 10 years of waving their flag in protest, they were finally awarded a trip from the ESPN College Gameday crew. They didn’t disappoint, as they provided one of the most raucous crowds in the show’s illustrious history. Later that night, Wazzu won a thriller over division rival Oregon, while Purdue simultaneously ended Ohio State’s national title hopes by blowing the Buckeyes out in West Lafayette. 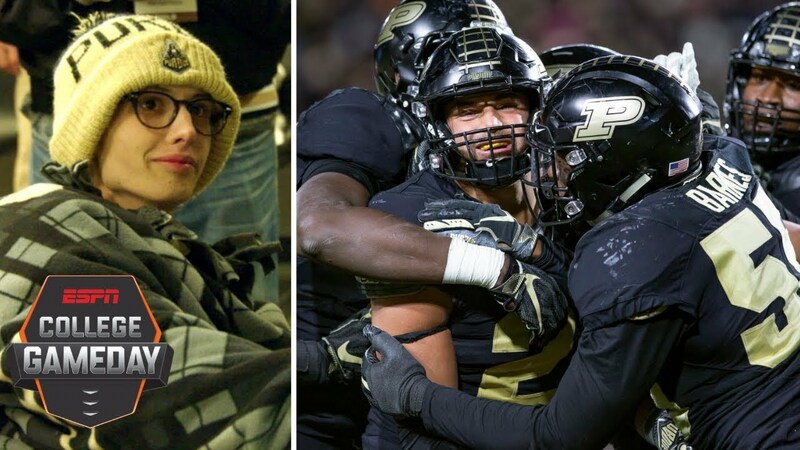 That upset became especially poignant when the Boilermakers dedicated their win to team fanatic and former Purdue student Tyler Trent. The kid is suffering from uncurable bone cancer and has been under hospice care since early Fall. His mom said on the Gameday feature that the Ohio State game was probably the last game he’d get to go to. When people say “sports don’t matter they’re just games” a story like this emerges to prove that sports can actually be literal matters of life and death. All in all, Hollywood couldn’t have created a greater college football night than this ended up being. 5. Wake Forest tennis wins first national championship (May 22, 2018)– Tennis has always been one of my favorite sports to both play and watch, so given how big of a college sports fan I am, college tennis is something I have naturally been into despite the fact that it is rarely televised. My alma mater (Wake Forest) has always had a decent tennis program, but nothing elite, until they built a state-of-the-art tennis complex in 2011. Ever since then, this program has gradually ascended the rankings culminating in the team’s first-ever national championship this past May. What made this championship especially sweet is that Wake hosted the tennis national championships for the first-time this season, which enabled me to attend their final match. I have now seen Wake win its last three national championships in person: their 2005 field hockey title, 2008 men’s soccer championship, and this year’s tennis title. I also loved the fact they beat Ohio State in the championship, a team I despise in absolutely every sport. 6. New Year’s Day Trifecta: UCF, Alabama, and South Carolina all pick up huge bowl wins (January 1, 2018)- Because I use the calendar year as the basis for these rankings, portions of both this season and last season are featured on these annual lists. This moment happened at the tail end of last season, as three of my favorite teams picked up historic bowl victories. First of all, South Carolina upset Michigan in the Outback bowl, marking the first postseason victory of the Muschamp era at South Carolina. Then, UCF picked up the biggest win of the day by shocking Auburn in the Peach Bowl to claim a share of of their first-ever national championship (I voted them # 1 as well). The cherry on the top came in the evening game when Alabama smashed Clemson in the second playoff semifinal to get revenge from their 2017 title game defeat. These three victories were so big, I haven’t even mentioned the best game of the day which was the overtime thriller in the Rose Bowl between Oklahoma and Georgia. All in all, it was a tremendous day of football. Unfortunately, New Year’s Day 2019 won’t have the same impact, as this year’s playoff semifinals will be played on December 29th. It is a shame that the college football powers that be still haven’t stood up to the Rose and Sugar Bowls and demanded that the playoff semifinals always be played on New Year’s. Just another one of the insanely illogical aspects of the college football postseason. 7. 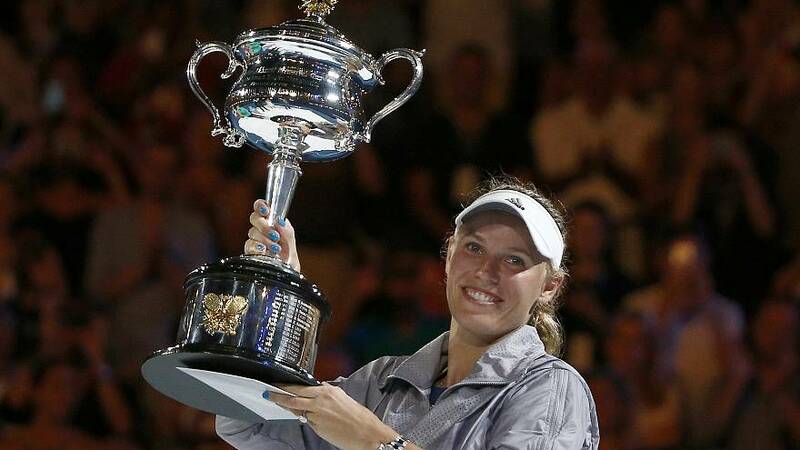 Caroline Wozniack captures first grand slam title by winning Australian Open (January 27, 2018)- Wozniacki has always been one of my favorite female players in the game. No, not just because she’s beautiful, but because she is the premier athlete in Demark, which is the foreign nation where I possess the closest family ties (my grandmother was first generation Danish). Those of us who have followed her throughout her career, know how big this was for her and her country, as she has always been be one of those players that just couldn’t get over the grand slam hump despite being one of the top players in the game. It all came together for Caroline in this year’s Australian Open as she was able to outlast Simona Halep in a thrilling, three-set final over the tournament’s top seed. Not only was this Wozniacki’s first grand slam title but it was also the first for her home county of Denmark. 8. Shaun White wins gold medal in his final olympics (February 13, 2018)- Like most sports fans, the olympics are the one-time every four years where I watch obscure sports such as bobsledding, biathlon, and snowboarding. The fact that these sports’ championships only take place every four years enhances the significance of who wins and who loses. That is why Shaun White’s shocking loss in the 2014 olympics was so devastating, and why his glorious rise to win a final gold medal in 2018 was so magical. Every olympics contains one or two moments like this, when a person or team’s triumphant victory captivates the entire nation. In the 2018 games, White’s come from behind win over Japanese powerhouse Ayumu Hirano served as this moment. 9. Alabama beats Georgia in College Football “National Championship Game” (January 8, 2018)– I put quotations around the alleged title of this game because I truly believe UCF won last year’s national championship a week earlier on New Year’s Day. Nevertheless, a majority of the sporting public recognized this later matchup between Bama-Georgia as the sport’s title game (ironically played in the same stadium as UCF’s triumph) , so it still maintained quite a bit of a significance. I wasn’t necessarily thrilled to see Alabama win another championship (they have won enough), as much as I was happy to see Georgia not win one. The Bulldogs, along with Clemson and Ohio State, make up the holy triumvirate of teams I will never cheer for in college football. Thus, I was quite elated to see them lose a heartbreaker in the title game, especially because Clemson had won broken my heart in this game in 2017. In addition, the Tua Tagovailoa led comeback in the game was a great sentimental storyline. 10. 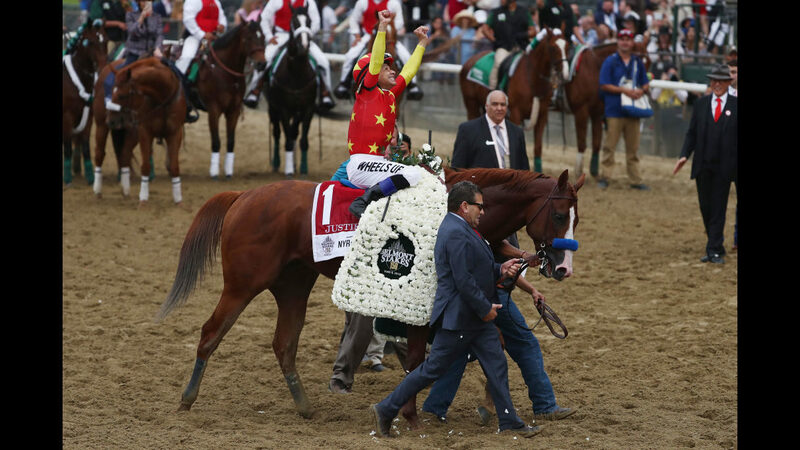 Justify wins Triple Crown (June 9, 2018)- If you would have told me four years ago that a horse racing triple crown would be as low as # 10 on my favorite sports moments of the year list I wouldn’t have believed you. After all, this was a feat that ranked # 3 in the all-time things I wanted to see happen in my life as a sports fan. However, after American Pharoah won it in 2015, seeing Justify do it again just three years later in pretty much the exact same manner Pharoah did (Baffert trained, front-running style, favored in all three races), lacked a little bit of luster. There was also the controversy that emerged as fellow trainers accused of Baffert of using his stablemate, Restoring Hope, as a blockade to fend off any closers from catching Justify down the stretch. I’ve re-watched the race and don’t think that Hope’s “moving screen” affected the race, but nevertheless, this Triple Crown just wasn’t as sweet as the one in 2015, especially since the horse immediately retired after the Belmont. With that being said, I never saw a triple crown winner until I was almost thirty years old, so any triple crown win still serves as a tremendous sports moment in my lifetime. 1. Philadelphia Eagles beat New England Patriots in Super Bowl LII (February 4, 2018)– Now on to the sporting events that I’d rather not remember. Those moments that punched me in the gut and ripped my heart. The # 1 moment for that category in 2018 has to be the Philadelphia Eagles beating my New England Patriots in this year’s Super Bowl. I have been a diehard Pats fan well before they got good, and this seemed to the be the year that Brady was going to tie his fellow GOAT Michael Jordan with six world championships. Unfortunately, the upstart Eagles and their backup quarterback spoiled the party, as they held off the Pats by a score of 41-33. 2. 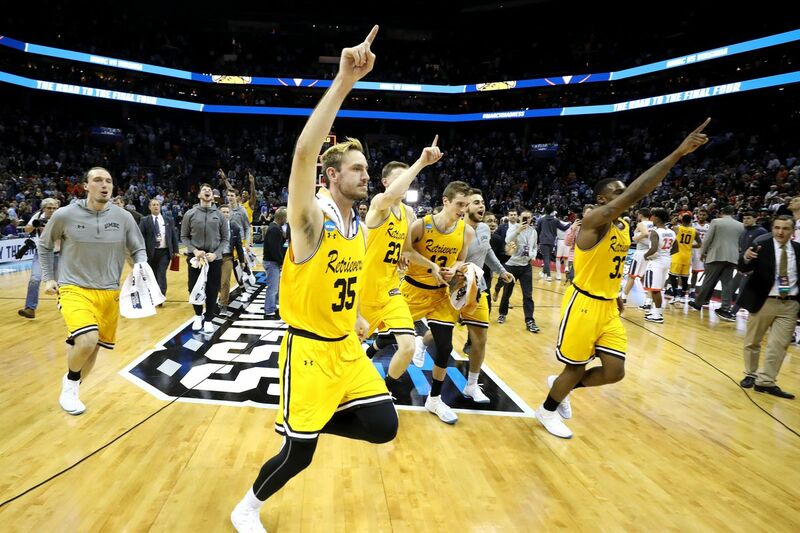 UMBC loses heartbreaker to Kansas State in 2nd Round of NCAA Tournament (March 18, 2018)– My # 2 and # 3 worst moments on this list are the unfortunate corollaries of my # 1 and # 2 best moments of 2018. After UMBC won its epic 16 over 1 game, I drove four and a half hours to Charlotte to see if they could pull off a second consecutive miracle, and they almost did just that. The Retrievers were within one possession of taking the lead in this game throughout the second half, but they could never get over the hump. They ended up falling by a seven in a loss that was certainly made more disheartening by the fact I was in attendance to witness it. One thing I never thought about it over the years when imagining how amazing the 16 over 1 upset would be, was how quickly it would all be over. In less than 48 hours, UMBC and every college basketball sentimentalist from around the country went from celebrating the greatest win we have ever seen to hanging our heads in defeat in downtown Charlotte. 3. Loyola Chicago’s Cinderella Run ends against Michigan in the Final Four (March 31, 2018)– As we saw in worst moment # 2, the crashing end of a Cinderella run can almost as heartbreaking as the joy it brings along the way. The same thing can be said about moment # 3. As described above in best moment # 2, Loyola Chicago became arguably the most surprising and captivating team ever reach the final four. And even though the odds were still long that they would leave San Antonio with a championship trophy, the Ramblers were close enough to allow us to dream about it, especially when they led deep into the second half against the Wolverines of Michigan. Nevertheless, midnight finally struck on Cinderella as it does every tournament (exceptions: 1985- Villanova, 1983- NC State), and Loyola suffered a gut-wrenching defeat as Michigan pulled away down the stretch. 4. English soccer loses World Cup semifinal heartbreaker to Croatia (July 11, 2018)– Even though the U.S. didn’t play in this year’s World Cup, I still had plenty of excitement about the prospects of Denmark and England making a deep run in the tournament. As many of you all know from my obsession with Andy Murray, British sports are something I’ve been infatuated with from an early age and nothing is bigger in Britain than England in the world cup. This year’s squad made a Cinderella run all the way to the World Cup semifinals and appeared that they were on their way to playing arch rival France in the final after getting a 1-0 first half lead against Croatia. However, the Three Lions wore down in the second half, and Croatia was able to pick up a goal in the 68th minute followed by one in extra time to break the hearts of British sports fans everywhere, who have sadly had their hearts broken more frequently than any fan base ever should. 5. Bryant Crawford foregoes his senior season at Wake Forest and declares for NBA Draft (May 29, 2018)– After years of disappointment, Wake Forest basketball was finally set to have a decent basketball season in 2018-19 with three experienced guards (Keyshawn Woods, Bryant Crawford, and Brandon Childress) coming back to join forces with blue chip recruits Isaian Mucius and Jaylen Hoard. A program that had not won a tourney game since 2010 seemed to finally have a chance to make tourney run. Unfortunately, those dreams were dashed before the season started. Woods transferrred and Ohio State but even more damaging, three year starter Bryant Crawford decided to declare for the NBA draft and forego his senior season at Wake. Now players do this all the time when they have a decent chance to be drafted, but Crawford’s decision was truly perplexing, as he wasn’t even a top 100 NBA prospect. Basically, he chose to play professional basketball overseas instead of trying to lead Wake back to the NCAA tournament, which is definitely an indictment of the current state of Manning’s program. This decision doomed Wake’s season before it even started, as the Deacons currently sit in second to last place in the ACC with a 6-4 overall record including losses to St. Joe’s, Houston Baptist, and Richmond. The silver lining from this terrible moment is that it may lead to the firing of embattled Wake coach Danny Manning, who has failed to turn the program around in his five years on the job. 6. 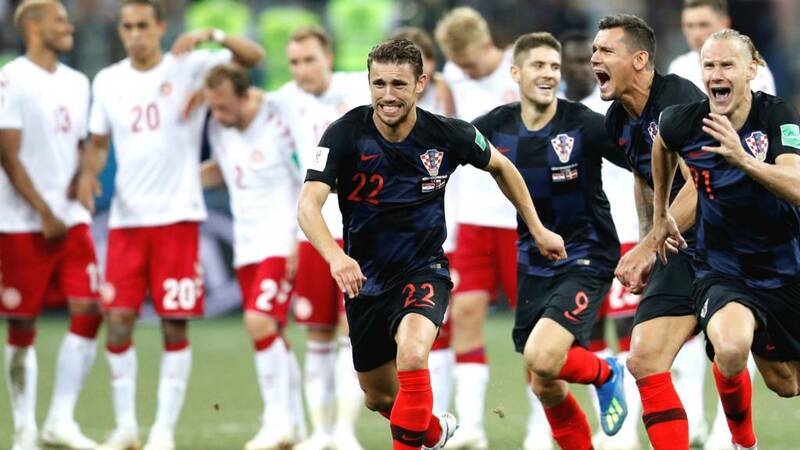 Denmark loses World Cup Round of 16 heartbreaker to Croatia (July 1, 2018)– Before the Croats were ripping my heart out with their overtime win over England, they beat my other favorite foreign soccer team ten days earlier in a penalty shootout. Denmark, led by stud goalie Kasper Schmeichel and his mystifying saves, entered into a penalty shootout with Croatia after 120 minutes had been played, and the two squads were deadlocked at a 1-1 tie. The two squads answered each other for four frames, but then in the final round, Denmark missed and Croatia scored sending the Danes back home in gut-wrenching fashion. Had the Danes won they likely would have gotten to play England in my dream semifinal matchup, guaranteeing one of my favorite teams would reach the World Cup final. Instead, both fell short of the championship game. 7. Fantasy Football Meltdown: my four fantasy teams all lose Super Bowls (December 23, 2018)– Keep in mind that this is a subjective ranking of what moments were the greatest and worst to me personally. Well, two days ago I had one of my biggest sporting disappointments of the year when all four of my fantasy football finalists all lost. Every year I play in six different fantasy leagues with the hope of guaranteeing myself at least one fantasy championship every season. This year I was in great shape as I put five teams in fantasy football playoffs and then placed four in fantasy football championship games. 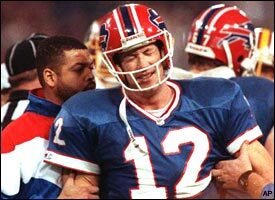 Unfortunately, Zach Ertz and Jamaal Williams decided to have their best games of the season against me in multiple different leagues, and I ended up falling short in all four fantasy super bowls, a la Buffalo Bills of the 1990s. Three of the games weren’t close, but I entered Monday night with a decent chance at winning one championship, as all I needed was Jared Cook to outperform Phillip Lindsay. My chances of victory strengthened when Lindsay exited the game for good with a hurt hand in the second half after scoring only 7 fantasy points. Nevertheless, the Raiders failed to even target Cook in the second half of their victory, despite the announcers repeatedly calling for them to do so. In the end, I fell by four points solidifying last weekend as the worst fantasy weekend of my life. 8. Team Europe destroys the United States in the Ryder Cup (September 30, 2018)– In recent history, Team Europe has destroyed the United States in Ryder Cup play winning four of the past five meetings and seven of the past ten. Nevertheless, after the United States won the 2016 edition, they were made the betting favorites to retain their cup on foreign soil for the first-time since 1993. The biggest disappointment here may have been that I wasn’t able to place a legal wager on Team Europe before betting closed, as the Yanks proceeded to get dominated by a 17.5-10.5 margin this past September. I kind of saw this collapse coming, but its nonetheless disappointing to see the best golfers in America consistently underachieve in this event. 9. Duke demolishes Kentucky in college basketball season opener (November 6, 2018)- I know early season college basketball matchups don’t matter that much in the grand scheme of the season, but nothing makes my blood boil quite like a Duke vs. Kentucky basketball game. Ever since Christian Laettner ripped my heart out on March 28, 1992, this rivalry has been the most significant in my sporting life. Every time these two squads take the floor against one another I feel like I am entering the Invasion of Normandy during World War II. Thus, it was certainly demoralizing to see the Cats get completely annihilated by a Blue Devil squad they were actually favored to beat. The 34 point defeat was not only the worst Kentucky loss in the history of this rivalry, but it was the worst Kentucky basketball loss period since a 41 point loss to Vanderbilt in 2008. This result also signified that Duke is going to be the team to beat in this year’s NCAA tournament, and Kentucky looks to be their typical underachieving 4 or 5 seed. There is plenty of time for the Cats to prove me wrong, but even their recent win against North Carolina hasn’t taken the sour taste of this defeat out of my mouth. 10. Francesco Molinari wins British Open (July 22, 2018)– Unlike most American golf fans who adore the Masters or the U.S. Open, the British Open is the golfing major that excites me the most. Whether it be the beautiful links style layouts or the late night/early morning tee times, this tournament captivates me like no other. That is why I was particularly exited when so many great sentimental storylines emerged during the final round. There was Kevin Kisner, the South Carolina boy, in search of of his first major championship. Rory McIlroy was looking for his first major title in four years. Justin Rose was playing his best British Open since he almost one the thing as a seventeen year old in 1998. Xander Schauffele was looking to inspire the next generation of minority golfers by becoming the first African-American major winner since Tiger Woods. And then of course, there was Tiger. Looking to complete one of the great comeback stories of all-time as he stood on the 10th tee with a 1 shot lead over the field. Unfortunately, none of these storylines panned out and a boring Italian dude won the thing by making a bunch of boring pars. Talk about a disappointing end to a major championship. These are in order from my most confident pick to least confident. Lines are based on the current consensus spreads according to the Five Dimes online sportsbook. Some bowl games produce fascinating matchups. Others produce complete duds. Here is my subjective ranking of most intriguing bowl games for the 2018 season. For the 17th straight season, I have created a mock college football playoff bracket based my proposed college football playoff system. I know that a four-team playoff has emerged, but I still think we can do a lot better. You will see below that 16 is clearly the magic number for the ideal college football playoff, as I will present to you the most comprehensive college football playoff proposal you will see anywhere. Anyone that would like to see this playoff in an excel bracket format then just let me know, and I’ll send you a copy. Teams can’t play on their home field except in semifinals or finals. 2018: Tampa, FL; Annapolis, MD; Memphis, TN; Mobile, AL; San Antonio, TX; Houston, TX; Albuquerque, NM; Las Vegas, NV; 2019: Jacksonville, FL; New York, NY; Shreveport, LA; Birmingham, AL; Fort Worth, TX; Frisco, TX; San Francisco, CA; Honolulu, HI. 2020: Charlotte, NC; Detroit, MI; Nashville, TN; Montgomery, AL; El Paso, TX; Dallas, TX; Boise, ID; San Diego, CA. The bowl sites of Arlington, TX (Cotton), Orlando, FL (Citrus), Glendale, AZ (Fiesta), and Atlanta, GA (Peach) will be annual elite 8 sites. This is the time where things get tricky, as I try to accommodate the rest of the bowl eligible teams who do not make the 16-team playoff. There will be 19 bowl games held at all the first-round sites who are off of the playoff rotation and the three bowl-only sites of: Nassau, Bahamas, Tucson, AZ, and Boca Raton, FL. The names of the bowls will remain the same. Overall, in this system there will be 54 1-A postseason teams (16 in playoff, 38 in bowls), which is much more reasonable than the current number of 78. Honestly, by taking out some of the garbage teams who currently squeak into bowl games, I think this system will actually make the bowl games more meaningful and watchable. Made a few changes to last week’s edition based on the championship weekend results. Feel free to comment or debate.